I should take a scrap out of Ellen DeGeneres’s book though. She corrected herself while speaking to two students on her TV show, both Parkland shooting survivors. “I shouldn’t even call you kids. You’re young adults doing so much for all of us.” And she thanked them for bringing about a change. In perusing the overnight backlog of posts on my feed — all those speeches — I found myself feeling sorry that the kids delivering those speeches had moved a few blocks away from being ‘just kids’. Given what it’s come to, how could these teenagers now go about their possibly earlier lives — just hazarding a guess here — of being dour-faced, of throwing tantrums or busying themselves with friends and pajama parties and college applications, and everything else that kids busy themselves with? No. Here they were, angry, self-possessed, well within reason to be both, and swaying even the more cynical TV watchers, talking about hope and voting and the six minutes it took for their classmates to be gunned down. Where under those conditions is there scope for normalcy? Even the most sulky teenagers would have had to grow up overnight after being in school lock downs, surviving brushes with death, lucky to have not been on the radar of ‘lone wolf’ shooters in possession of guns so easy to buy? 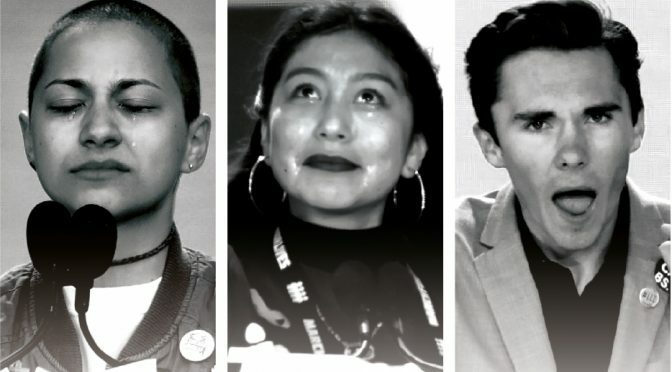 Saturday’s March For Our Lives rally in Washington DC was all about young people, these survivors of the several school shootings in America, demanding change and meaning business. The massive crowds were more inclusive — lots of parents, lots of banners. There was not one politician on that stage in DC. Just purposeful young adults, reading out their speeches from paper but looking up at the crowds a lot, stating facts, becoming emotional, demanding their right to live, shoving ultimatums (“We will vote you out!”) for the benefit of complacent politicians. These school-goers, soon to be of voting age, all with energy and clarity of agenda: for law makers to stop taking money from the National Rifle Association (NRA), knew what they wanted and how to say it. I liked Parkland student Cameron Kasky’s speech demanding common sense gun laws very much. He wasn’t shy exactly. But there was an endearing quality to his delivery. “Welcome to the revolution…” he said. Loud cheers. “Beware the voters are coming.” More loud cheers. The speech of another organiser, David Hogg, age 17, in his grey jacket and stern jaw, was pointed, fist punches and all. “When politicians send their thoughts and prayers with no action, we say, ‘No more.’” Cheers all around. The endless crowd in DC cheered wildly. She had supporters till the horizon. On Twitter, people wrote, ‘She’s my President!’ Some said too bad we have to wait 24 years for her to run for President. I didn’t even know till that tweet that you have to be 35 before running for President in the US. I watched a bunch of speeches. At the more poignant moments in some, I found myself moved that I didn’t know their fear first hand. How far can empathy go? Pretty far, sure. But for whatever else plagued India, I felt safe at school. Now, even that is rare. What kind of a world is that to live in? However wretched the travails of my school life: getting unit test copies featuring dismal slap-inviting marks signed by my parents, I never knew or considered ‘lock downs’ or shooters on the loose, or siblings caught in some crazy school yard crossfire with rifles! This stuff is normal for Americans. This stuff is why there was such a call to action. Student activist-survivor Jaclyn Corin drew attention to another fact, “Obviously, school safety is important but it doesn’t just happen in schools. And people need to understand that it’s a public safety issue, not a school safety issue”. Churches, grocery stores, malls — what is a safe place in a country where buying a weapon is easy peasy? Edna Chavez, 17, was another force on stage. “My brother! He was in high school when he passed away… it was a day like any other day. The sunset was going down on south central. You hear pops thinking they were fireworks. They weren’t pops. You see the melanin on your brother’s skin turn grey. Ricardo was his name… Can y’all say it with me?” The crowd obliged: Ricardo! Ricardo! Ricardo! I didn’t know Brewster. But I do know the name Emma Gonzalez. I admire her fierceness, her vulnerability, her outspokenness. And this endorsement sent me to YouTube right away. When I listened to the power and the timed silence she packed into her speech of a little over six minutes — the time she said it took for the shooter at Parkland to halt his killing spree — I thought it was no surprise that she’s being compared to Joan of Arc. Just like it would be no surprise for this massively courageous bunch of students to herald the end of gun violence and to steer things around in that country. ‘Never Again’.